FC2305 Microscopic view of stem cell with processes. Credit: 3D4Medical / Photo Researchers, Inc.
﻿P6031 Biological clock. Conceptual image depicting human biorhythms showing a clock superimposed on a woman's naked body. Many biological processes are believed to take place under the direction of an internal clock mechanism. Processes such as wakefulness and tiredness are based on a daily or circadian (24 hour) cycle regulated by hormones such as melatonin and cortisol. Another example is the menstrual cycle, which repeats itself roughly every 28 days in fertile women, also controlled by hormones. Credit: Dennis Potokar / Photo Researchers, Inc.
BR7535 Male XY chromosomes. Chromosomes are a packaged form of the genetic material DNA, which condenses into chromosomes during cell replication for ease of division and transport into the new cell. Each chromosome consists of two identical strands (chromatids), aligned parallel to each other and joined at an area called a centromere. Illustration of microscopy. Magnification: 3600x per 10 cm. Credit: James Cavallini / Photo Researchers, Inc.
SM4960 Methotrexate drug. Syringe containing the antifolate drug methotrexate. It works by inhibiting the metabolism of folic acid (vitamin B9), which is necessary for the production and maintenance of new cells. 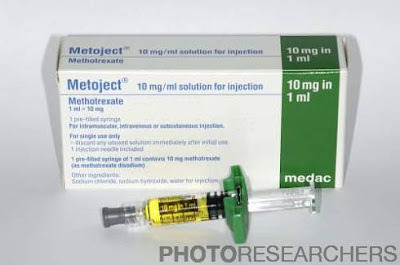 Methotrexate is used to treat cancers, and also some autoimmune diseases such as myositis (muscle inflammation), Crohn's disease (intestinal inflammation), psoriasis (skin inflammation), rheumatoid arthritis (joint inflammation), and scleroderma (connective tissue hardening). 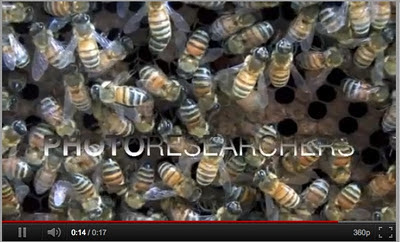 Credit: Dr. P. Marazzi / Photo Researchers, Inc. In the news: "The value of a good editor" The Economist January 7, 2012 2W6340 The discoverers of the structure of DNA. James Watson (b.1928) at left and Francis Crick (b.1916), with their model of part of a DNA molecule in 1953. Crick and Watson met at the Cavendish Laboratory, Cambridge, in 1951. Their work on the structure of DNA was performed with a knowledge of Chargaff's ratios of the bases in DNA and some access to the X-ray crystallography of Maurice Wilkins and Rosalind Franklin at King's College London. Combining all of this work led to the deduction that DNA exists as a double helix. Crick, Watson and Wilkins shared the 1962 Nobel Prize for Physiology or Medicine, Franklin having died of cancer in 1958. Credit: A. Barrington Brown / Photo Researchers, Inc.
SH1834 Heart transplant. Conceptual image of a surgeon holding a heart. 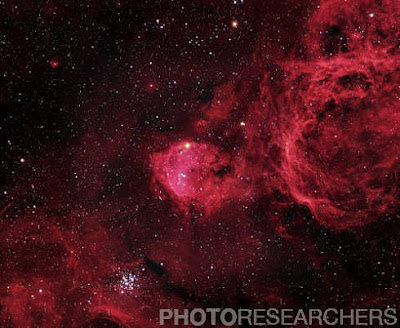 Credit: Kevin Curtis / Photo Researchers, Inc.
SH9283 Emission nebula (NGC 3324), optical image. This nebula, sometimes known as the Keyhole nebula, is a part of the larger Eta Carina nebula. It lies in the Carina constellation, and is only visible from the Southern hemisphere. Emission nebulae are clouds of gas and dust that are ionized by radiation from hot stars within them, causing them to glow. An open star cluster is visible at lower left. Credit: Robert Gendler & Martin Pugh / Photo Researchers, Inc.
BF0413 Fruit fly. 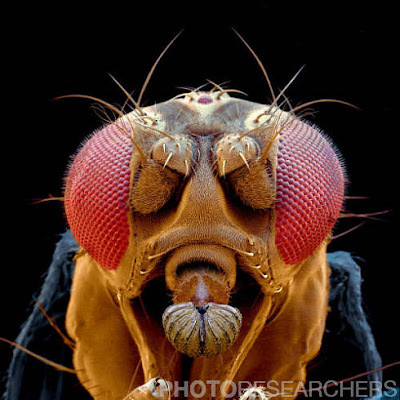 Colored scanning electron micrograph (SEM) of the head of a fruit fly (Drosophila sp.). Its two compound eyes (red) are seen on either side of its head. At lower center is its proboscis, used for sucking up food. This fly is widely used in genetic experiments as it breeds rapidly and has a small, well-understood genome (genetic code). Credit: Eye of Science / Photo Researchers, Inc.
SN4528 Titov and Glenn at the Lincoln Memorial. Soviet cosmonaut Gherman Titov (left, 1935-2000), the second person to orbit the Earth after Gagarin, was launched into space on the Vostok 2 spacecraft on 6 August 1961. 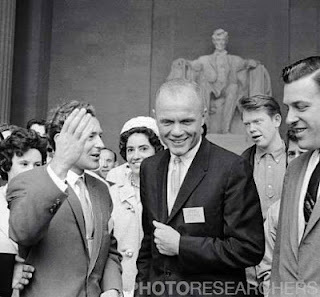 US astronaut John Glenn (center, born 1921) was the first American to orbit the Earth, doing so on the Friendship 7 spacecraft on 20 February 1962. The Lincoln Memorial, dedicated in 1922, commemorates Abraham Lincoln (1809-1865), the 16th President of the United States. Photographed in Washington DC, USA, on 13 June 1962.
Credit: RIA Novosti / Photo Researchers, Inc.
"Like How Your Hair Hangs? 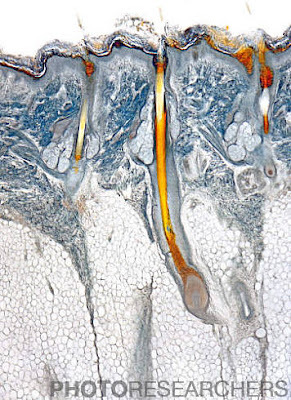 Praise the Laws of Physics"
BT0885 This thick, stained vertical section shows parts of three hair follicles (the central one with its 'root' with papilla), two of them with arrector pilae muscles, three sebaceous glands and a coiled sweat gland (right-hand side). The lower half is almost entirely made up of adipose tissue (fat). Vertical Field Width = 3.5mm. Credit: M. I. Walker / Photo Researchers, Inc.
Alzheimer's disease culture cells. Colored scanning electron micrograph (SEM) of cells used in Alzheimer's disease research. These cells have been genetically engineered to produce amyloid precursor protein (APP), which in turn forms the protein amyloid. Plaques of amyloid in the brain are a major pathological feature of Alzheimer's disease. 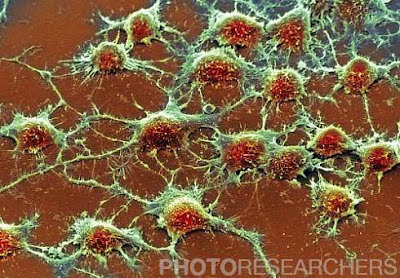 These cells are cultured from a nerve cancer (neuroblastoma), and have shorter and more numerous processes (dendrites and axons) than healthy nerve cells. Alzheimer's is a brain-wasting disease common in the elderly. It causes confusion, memory loss, personality changes and eventually death. Magnification unknown. 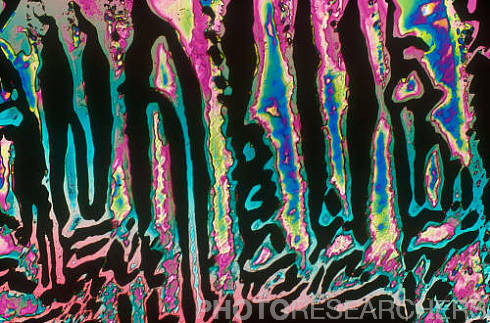 Credit: Simon Fraser / Photo Researchers, Inc.
7U3972 Light micrograph of crystalized progesterone, a female hormone. Magnification: 10x at 35mm. Credit: Michael W. Davidson / Photo Researchers, Inc.
SN1269 Xenotropic murine leukemia virus particles (green), colored transmission electron micrograph (TEM). Each virion (virus particle) consists of a core of RNA (ribonucleic acid) surrounded by a protein nucleocapsid and lipid envelope. This mouse retrovirus is also able to infect cells of other species, including humans. Magnification: x65,000 when printed at 10 centimeters tall. 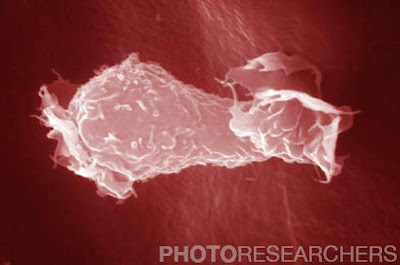 Credit: Dr. Gopal Murti / Photo Researchers, Inc.
BP3369 Scanning electron micrograph (SEM) of a human macrophage. Found mainly in the liver and lymph nodes, macrophages are a part of the immune system. Their primary function is to ingest (phagocytosis) and destroy anything they do not recognize as healthy tissue. Magnification x 2,500 (at 4x4"). Credit: David M. Phillips / Photo Researchers, Inc.
SB7101 Andrey Kapitsa. 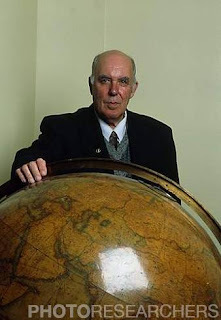 View of the Russian geographer and discoverer of Lake Vostok, Andrey Kapitsa (born 1931). Kapitsa was born in Cambridge, England while his father Pyotr was working at the University there. After reading geography, he traveled to Antarctica in 1956. There, he postulated that huge lakes could exist far below the ice, kept liquid by the Earth's heat. In 1966 he found anomalies in his seismic readings at the Russian Vostok base, but it was only 30 years later that he realized the readings betrayed the presence of water. Named Lake Vostok, it is hoped it will reveal the history of Antarctica, and may even harbor strange life around its warm floor. Credit: Volker Steger / Photo Researchers, Inc.
SK8316 Artery tissue layers, fluorescent light micrograph. 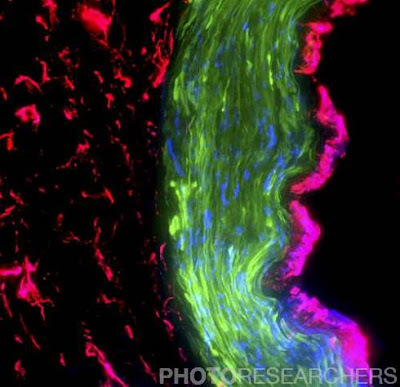 Fluorescent dyes have been used to highlight tissues and cellular structures: microvasculature (red), smooth muscle (green), cell nuclei (blue), intima (pink). The layers seen here are the tunica intima (right, pink, the internal layer), the tunica media (center, green, the middle layer) and the tunica adventitia (left, red, the outer layer). Credit: Roger J. Bick & Brian J. Poindexter / UT-Houston Medical School / Photo Researchers, Inc.